The crisis in Ukraine that began with the Euromaidan movement, and the flight of President Viktor Yanukovych, put the Azerbaijani government in an uncomfortable position. For the last few years, Baku has been building good relations with Russia, hoping to persuade Moscow to stand on Azerbaijan’s side in resolving the Karabakh conflict. Massive arms purchases from Russia, a benevolent foreign policy toward Moscow, and Baku’s unwillingness to deepen relations with the European Union and NATO, have all created a positive image of the country in the eyes of Russian authorities. But the Russian occupation of Crimea, and support for separatists in the Donbas have complicated Azerbaijan’s position. While the Azerbaijani government fully supports Ukraine, Baku cannot afford to spoil relations with Moscow due to the latter’s significant leverage in the Caucasus. Azerbaijan is left with the option of trying not to irritate Russia while staying on the side of those who object to Russia’s intervention. At the same time, the Ukraine crisis and a fear of interrupted gas supplies has led to renewed attention by the European Union to the need for an alternative transport system for delivery of gas from the Caspian region to European states. 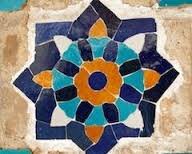 European consumers have even begun to express interest in revitalizing the idea of a Trans-Caspian gas pipeline that would deliver Turkmen gas to Europe via Azerbaijan. The Ukraine crisis has made Baku’s geopolitical stance a high prize. The Ukraine crisis has made Baku’s geopolitical stance a high prize. During the early stages of the Euromaidan movement, Azerbaijan did not take sides. The authorities tried to wait and see in the hope that the crisis would reach a swift resolution. However, Russia’s occupation of Crimea, and the start of military conflict in eastern Ukraine turned public and elite opinion entirely over to the side of Ukraine’s new government. For the Azerbaijani public, the situation was highly reminiscent of the Karabakh conflict. The Russian occupation of Crimea, and the rise of separatist-led fighting in the Donbas appeared to closely parallel Russia’s actions in support of Armenia’s occupation of Karabakh during the 1990s. Even the shooting down of Malaysia Airlines Flight MH17 over a separatist-controlled area of eastern Ukraine was reminiscent of the shooting down by Karabakh separatists of an Iranian airliner in 1993. While Russia appealed to the principle of self-determination in Crimea, Azerbaijan has long held fast to the principle of territorial integrity. Azerbaijan made clear its support for Ukraine’s territorial integrity in the March 2014 UN General Assembly vote on Ukraine; and Azerbaijan was among more than one hundred countries that voted in favour of the resolution in support of its territorial integrity. Among the members of the Commonwealth of Independent States (CIS), Moldova was the only other to vote in favour. Russia, Belarus, and Armenia voted against it while the others abstained (Kazakhstan and Uzbekistan) or were conveniently absent (Kyrgyzstan and Tajikistan). Baku has also supported the territorial integrity of Ukraine in the Council of Europe Parliamentary Assembly (PACE) and elsewhere. Meanwhile, Baku has tried to use the situation in Ukraine to its own advantage by calling attention to the parallel with Azerbaijan’s own separatist conflict. President Ilham Aliyev has repeatedly pointed out that the West is applying double standards: it imposes sanctions against Russia for its occupation of Crimea and support of separatism in the Donbas while it has never considered sanctions against Armenia for the occupation of Karabakh. Russia’s bold actions and disregard of international law has sparked fear that Armenia may follow Russia’s path and formally annex Nagorno-Karabakh and the surrounding occupied territories. Although the Azerbaijani government understands that such a move would make Armenia a global pariah, Baku has some fear that Russia, which wields considerable influence over Armenia, might threaten Azerbaijan with such an outcome. The clashes between Azerbaijani and Armenian armies in Karabakh, in July and August demonstrated the fragility of the current truce. Azerbaijan considered the tensions, which left dozens dead from both sides, to be a result of Russian pressure on the eve of a meeting between the presidents of Armenia, Azerbaijan, and Russia. Authorities feared that through these tensions Russia was sending a signal to Azerbaijan not to align closer with the West, and even to consider the possibility of joining the Eurasian Union. At the same time, Baku holds out some hope that sanctions will weaken Russia sufficiently such that it will seek Azerbaijan as another reliable ally in the Caucasus, leading Moscow to pressure Armenia to withdraw at least from the occupied territories around Nagorno-Karabakh. Military cooperation is a key element of Russian-Azerbaijani relations. For its part, Moscow has already intensified contacts with Baku. In April, Russian Prime Minister Dmitry Medvedev appointed Deputy Prime Minister Dmitry Rogozin as chairman of the Russian delegation to the inter-governmental commission on economic cooperation with Azerbaijan. The appointment of Rogozin, who has responsibility for Russia’s defence industry, reinforces the fact that military cooperation is a key element of Russian-Azerbaijani relations. 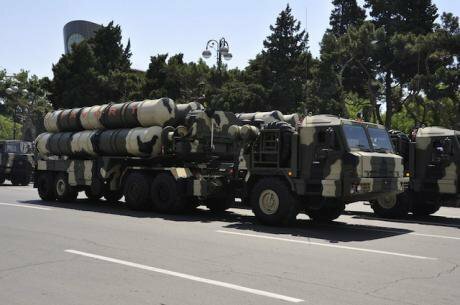 Over the last four years, Azerbaijan has imported about $3.35 billion in arms, of which 80% has come from Russia, including two S-300 missile systems, 94 T-90S tanks, 20 Mi-35M helicopters, and 100 BMP-3 armoured vehicles. Azerbaijan has also purchased 25 Su-25 planes and 93 T-72M1 tanks from Belarus, Russia’s ally. Overall, trade turnover with Russia in 2013 amounted to $3.5 billion, of which 83% were exports to Azerbaijan. In mid-June, Rogozin visited Baku, together with Foreign Minister Sergei Lavrov and parliamentary chairman Sergei Naryshkin. 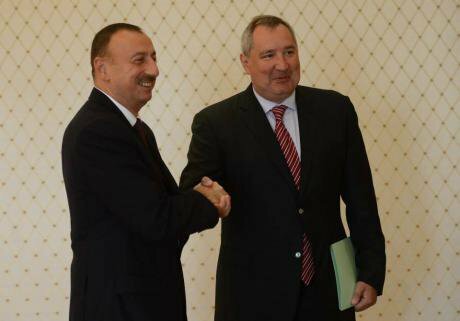 Their purpose was clear: to persuade Azerbaijan to move toward the newly formed Eurasian Economic Union (EEU). During a Russian-Azerbaijani forum later that month, 11 documents dealing with economic relations were signed. During his visit to Baku, Russia’s minister of economic development, Aleksei Ulyukayev, hinted at the possibility that Azerbaijan might like to join the EEU, but Baku clearly responded that it was not planning to join any type of economic union. Russia may yet try to forestall the development of an alternative route for Caspian gas to Europe. Finally, in August of this year, the presidents of Armenia, Azerbaijan, and Russia met in Sochi. Although the public was not informed of the results of this meeting, Azerbaijani observers surmised that Baku was the main target of the meeting, as well as of the recent escalation. Russia may yet try to forestall the development of an alternative route for Caspian gas to Europe, and use its own gas as a weapon in a bid to get Western sanctions lifted. In this case, Azerbaijan will have become a victim of others’ geopolitical contests. Meanwhile, the Ukraine crisis has to some degree played a positive role for Azerbaijan in its relations with the West. The crisis has once again revealed the fragility of the energy security environment in central and eastern Europe. New Russian threats to cut natural gas supplies to Ukraine in the absence of agreement on debts and a new pricing structure recalled the 2006 and 2009 winter ‘gas wars’ between Ukraine and Russia that resulted in shortages for customers across the region. The Ukraine crisis has energy security implications beyond the territory of the EU. Indeed, it directly impacts Azerbaijan. It is expected that the bulk of initial gas deliveries for the Southern Gas Corridor that is to deliver natural gas from the Caspian to Europe across the South Caucasus and Turkey will come from Azerbaijan’s Shah Deniz field (around 10 billion cubic metrеs annually, which could be expanded in the future). This corridor will significantly decrease the dependence of many eastern and central European states on Russian gas. Azerbaijan has even been interested in supplying gas to Ukraine. Until the Ukraine crisis this year, such discussions remained purely theoretical. In February, however, Ukraine’s government at last began to move forward to support the construction of an import terminal for liquefied natural gas (LNG), with an expected annual output of 10 billion cubic metres. The bulk of this LNG is expected to come from Azerbaijan, which is conducting negotiations with Georgia to construct an LNG terminal on Georgia’s Black Sea coast. In the meantime, Azerbaijan has been actively penetrating the Ukrainian energy market. Over the last four years, the State Oil Company of the Azerbaijan Republic (SOCAR) has invested around $160m in Ukraine, including 39 gas stations that operate under the SOCAR brand. The Ukraine crisis has also forced policymakers in the United States to focus more closely on Azerbaijan as a potentially reliable source of natural gas for Washington’s closest allies in Europe. In an April speech, US Department of State Special Envoy and Coordinator for International Energy Affairs, Carlos Pascual, underlined the role of the Southern Gas Corridor in helping achieve energy security for southern Europe. Baku will pursue its only sensible policy option: maintaining various balancing acts between the West and Russia. So long as the Ukraine crisis continues, Baku will pursue its only sensible policy option: maintaining various balancing acts between the West and Russia. Azerbaijan will continue to pour money into Russian weapons and equipment, less as instruments of war than as tribute to the Russian military-industrial complex. In addition, the sanctions against Russia, and Moscow’s counter-sanctions have made Baku an invaluable partner for Russia. Whether via political support or the supply of necessary agricultural products, Moscow may come to rely more on Azerbaijan than on Armenia in the Caucasus. This, however, will not help resolve the Karabakh conflict. The unresolved fate of these territories will continue to be Moscow’s card in negotiations with Armenia and Azerbaijan. All the efforts of the EU and the United States to solve the conflict will be torpedoed by Moscow. Meanwhile, Azerbaijan will strive to maintain good relations with the EU and the United States in the energy sphere, albeit keeping its distance more generally, in order to satisfy other domestic and foreign priorities.